The CEO of German powertrain parts maker Mahle has jumped ship to become CEO of ZF Friedrichshafen, the world's No. 2 auto supplier. ZF's board voted last week to name Wolf-Henning Scheider as CEO, filling a post held on an interim basis for the past month by ZF's CFO, Konstantin Sauer. Before running Mahle, Scheider, 55, ran the global automotive business of Robert Bosch. Bosch ranks No. 1, ZF is No. 2 and Mahle is No. 16 on Automotive News' list of the top 100 global suppliers, based on auto-parts sales to automakers in 2016. ZF has been without a full-time CEO since the sudden departure in December of Stefan Sommer. Sommer had been the architect of a dramatic multiyear repositioning of ZF. His vision was to convert ZF from a supplier of transmissions, gears, axles and steering systems to a leader in future autonomous vehicle technologies. That strategy had entailed billions in acquisitions, most prominently the $12.4 billion purchase of U.S. electronics supplier TRW Automotive in 2015. But company insiders say that Sommer was butting heads with ZF's most powerful individual — Andreas Brand, head of the Zeppelin Foundation, a nonprofit entity that owns 93.8 percent of ZF's stock. ZF's board moved quickly amid the executive churn to recruit Sommer's replacement. "As Mahle's CEO, Wolf-Henning Scheider demonstrated outstanding competence in regards to a game-changing transformation process," said ZF's supervisory board Chairman Franz-Josef Paefgen. Paefgen noted that Mahle had made it easy to nab its CEO. Paefgen said in a statement that he wished "to thank Mahle GmbH which enabled the quick and straightforward move of Wolf-Henning Scheider. The fact that the product portfolios do not have any overlaps has helped significantly in this process." Paefgen is new to the chairman job. 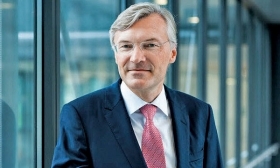 The retired president of Bugatti Automobiles, Paefgen was selected from ZF's supervisory board to become chairman shortly after ZF's previous supervisory board chairman, Giorgio Behr, abruptly resigned in the same December flare-up that brought Sommer's departure. But Paefgen and Scheider — as well as interim CEO Sauer — indicate that Sommer's grand plan, known internally as "Strategy ZF 2025," will remain ZF's direction. Mahle quickly responded to the change last week by naming Joerg Stratmann as CEO. Stratmann, 48, who came to Mahle in 2008 from the industry's No. 5 supplier, Continental, had been in charge of Mahle's thermal management business unit, which accounts for more than 45 percent of Mahle's sales. In a statement released last week, Mahle said it was able to name a new CEO quickly because Stratmann already had been earmarked as a possible successor.